Poetry Reading Festival on the Edge of the Winding Stream. 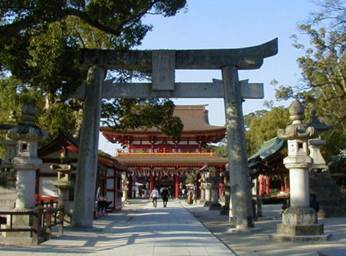 Take the Nishitetsu Train to Dazaifu Station, and walk along the approach to the shrine for about 5 minutes. Information is current as of March 1999. Please confirm that the information is accurate and current. We apologize for any inaccuracies and we welcome any feedback on updated details. It is said that the origin of KYOKUSUI-NO-EN is a purification ritual of floating a SAKE cup on a pure stream in the Shin era of China. In 353 (Eiwa 9th yr), in China, the aristocratic and graceful game of what we see now was established, and it was introduced to Japan and Korea later. The oldest record of KYOKUSUI-NO-EN in Japan was written in NIHON-SHOKI; the Emperor Kenzo held KYOKUSUI-NO-EN in 485. 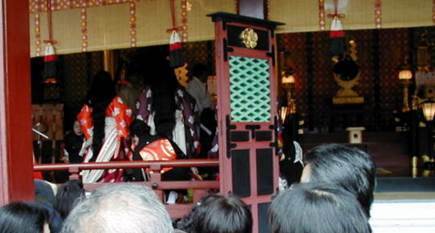 In ZOKU-NIHON-SHOKI, it is written that the Emperor Shomu held KYOKUSUI-NO-EN in 728 (Jinki 5th yr). Sugawara no Michizane participated in KYOKUSUI-NO-EN in the Imperial Court in 890 (Kanpyo 2nd yr). The first KYOKUSI-NO-EN in Dazaifu was held in 958 (Tentoku 2nd yr) in memory of Sugawara no Michizane by Ono no Yoshifuru, in DAZAI no DAINI position (the high position of Dazai government). Imperial people and court nobles in the then capital enjoyed KYOKUSI-NO-EN very much, but it lost popularity in later times. Yukichi Tanaka gathered sponsors and revived KYOKUSUI-NO-EN in DAZAIFU-TENMANGU in 1963 (Showa 38th yr) as it is now. Yukichi Tanaka worked for a newspaper, but changed his job to the advertising business, and made every effort to build Shinten-cho Shopping Arcade. He is also famous for his idea of NISHITETSU-HANA-DENSHA (the streetcars decorated with flowers and ornaments of Nishi-Nippon Railroad Co., Ltd.) in HAKATA-DONTAKU. Today famous people in IKAN-SOKUTAI (the formal costume of noble men in the Heian era) and JYUNI-HITOE (the formal costume of noble women in the Heian era), participate in KYOKUSUI-NO-EN in the the Dazaifu Tenmangu Shrine. They sit by the winding stream under the Japanese apricots in full bloom. The participants compose poems and write them down on a square piece of paper until a cup which is full of SAKE floats down to them. And then they place the square piece of paper in the stream, and drink the cup of SAKE which floats down to them. 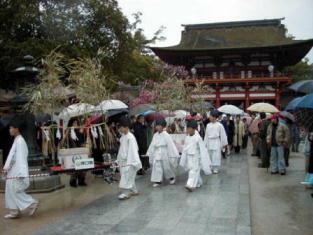 KYOKUSUI-NO-EN is held at the plum garden in the precincts on the first Sunday of March, every year. In 1999 (Heisei 11th), I was planning to go to see it with my family. Unfortunately, it was rainy on that day, and KYOKUSUI-NO-EN was postponed to the second Sunday. 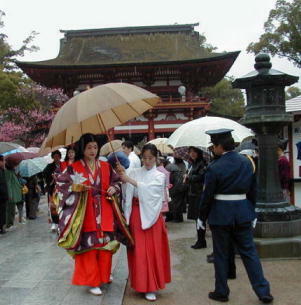 They said it was the first time since KYOKUSUI-NO-EN was re-established that it rained on the first and second Sunday. In spite of the rain, we went to the Dazaifu Tenmangu Shrine. I was too short to see the festival held inside, even though not so many visitors were there. It was so cold that we left the precincts soon after the festival, and we went into a noodle shop along the approach to the shrine to have hot food. Someday I hope I can go to see KYOKUSUI-NO-EN on a fine day. Copyright @ 1999-2015 All Rights Reserved.